The story that taking out student loans is a path to pauperdom rather than prosperity dominates the public conversation. One problem: its wrong. As we have covered repeatedly (see here and here) getting a four-year degree, even with student loans, is the best investment one can make. One part of the story about the negative effects of student loans is that it is stopping folks from buying a home. New data from the New York Fed shows how wrong that story is. Yes the data show that those with a four-year degree with student loans by the age of 33 have lower home ownership rates than those with a four-year degree without student loans. Which, of course, is what we should expect. Paying off student loans means you have less money to buy other things including a home. But the data also show that those with four-year degrees and student loans have higher home ownership rates at 33 than those with less than a four year degree, including those without student loans. The data, quite encouragingly, also shows that earning a college degree also mitigates substantially family background when it comes to owning a home. College graduates from households with below mean income tend to have home ownership rates nearly equal to those from above mean income households. Chakrabarti (Dr. Rajashri Chakrabarti, a senior economist in the Microeconomic Studies Function at the New York Fed) presented statistics that show that, by age 33, those who graduated from college with no debt owned homes at a rate above 45 percent, whereas those who graduated with debt owned homes at just under 45 percent. Those who did not attend college owned homes at a rate of between 25 and 30 percent. Bachelor’s-degree holders had higher home ownership rates regardless of debt status. For instance, bachelor’s-degree holders with student loan debt owned homes at a rate of above 45 percent, besting associate-degree holders without debt, who owned homes at a rate of just above 40 percent. 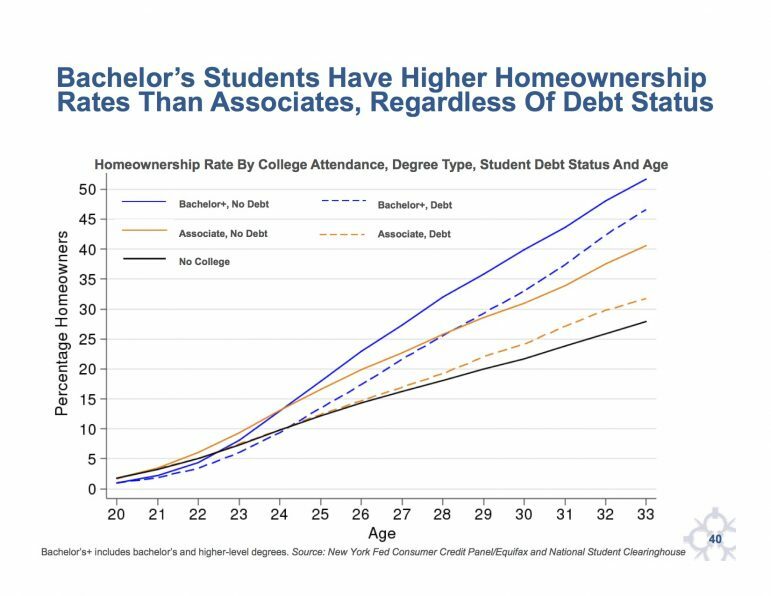 Chakrabarti noted that students who graduated with debt enjoy home ownership at higher rates than those who did not graduate — even those without debt — at every educational attainment level. 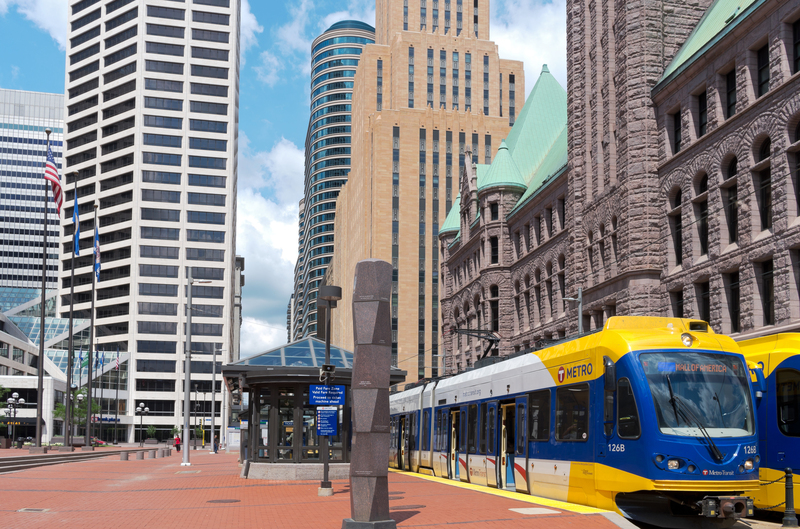 For instance, college graduates with debt owned homes at a rate of above 50 percent, whereas non-college graduates without debt only owned homes at a rate of under 40 percent. Is there any data showing the impact of obtaining a four year degree from the less expensive community colleges and state schools without debt vs graduating from much more expensive private schools and accumulating lots of debt? What this Federal Reserve study says is that if you have a four-year degree or more and don’t have student loan debt by the age of 33 you are slightly more likely to own a home than those with a four-year degree and are still paying off a student loan. But that those with a four-year degree and student loans own homes at a higher rate than those without a four-year degree and no student loans. The four-year degree is the key characteristic of young homeowners, not whether they have student loans or not. Clearly earning a four-year degree without loans is best. And starting at a community college and transferring to a state four-year college is a good way to do that. The problem is that not many who go to community college first, transfer, and earn four-year degrees.